Custom Breath Spray Personalized in Bulk, with Leash (optional). Cheap, Promotional, Customized in Full Color. Lowest prices in the USA and Canada. Bulk discount breath spray tubes, personalized with custom imprint in full color. We also supply wholesale breath spray tubes with generic "Ice Drops" label (not custom imprinted) for $0.87 each (minimum 250). Budget Prices for wholesale breath spray bottles in USA and Canada. American clients pay no taxes. You may add a personalized leash (see photo) for $0.65 per breath spray bottle. Free artwork design. We will send you a proof for your approval before production. Don't get caught with bad breath, give yourself a quick pump of our powerful breath spray and rejuvenate your breath. Unit prices below include your full color custom imprint. 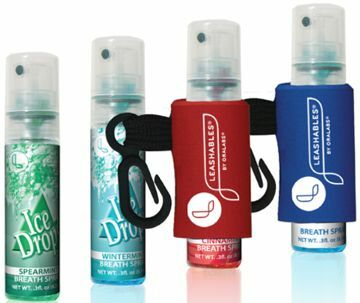 We also supply wholesale breath sprays with generic "Ice Drops" label (not custom imprinted) for $0.87 each (minimum 250). bottle, plus another setup charge of $45.00 per imprint color. Non-aerosol concentrated mint flavor breath spray. Long Lasting. CAPACITY: 0.34 oz. ; 30 mil. COLORS: Clear/Black Cap; Clear/Blue Cap; Clear/Clear Cap. IMPRINT AREA: 1 to 4 Color process label: 1.46" x 1.34"
PACKAGING: Bulk; 500 units per 19 lbs. carton. Optional Leash: add $0.65 per breath spray bottle, plus another setup charge of $45.00. The leash is personalized in 1 color. Add $0.25 for each extra imprint color. The imprint size on the leash is: 1.9" x 1.25". Leash colors: Aqua, Black, Forest Green, Light Blue, Maroon, Navy Blue, Neon Green, Pink, Purple, Red, Royal Blue or Yellow.